Today I did something I have never done before. I made Hae Bee Hiam. It was so different from what I normally would cook - I tend to go for quick and easy types of dishes - but because I had all the ingredients, and I have been thinking of making my own hae bee hiam for a while, I decided to be brave, and had a go at making it. Mine is a simple recipe. I started by soaking the dried shrimps for about 15 minutes to soften them. Then I drained them and set them aside. I cut the chilli (both normal chilli and bird's eye chillis), as well as the shallots and garlic, into smaller pieces. The chilli, shallots and garlic were placed in a blender and adding a little water as and when necessary, I used the pulse function and blitzed everything. Gradually, add the dried shrimps, and continue to blitz. You may need to add more water. Once everything was blended, I added sugar and salt and mixed. At this stage, the mixture is ready to be fried. Before you do, make sure you have everything you need nearby - a huge glass of iced water, tissue paper, whatever else that can make you more comfortable for the next, uhm, 30 minutes or so. Once you start frying, you can't go any where else. Otherwise you will end up with burnt hae bee hiam. In a heated wok, I placed the oil. Once the oil was hot, I dumped the mixture into the wok. I turned the heat down low, and started frying. As you fry, the mixture gets thicker and heavier. It would also look like there isn't enough oil. Worry not, there IS enough oil. Just. Keep. Stirring. Eventually, the mixture will start to loosen up. But keep stirring. (Are you starting to hate me for saying that?) Then the hae bee hiam will start to brown. When it becomes deep brown, turn off the fire, give yourself a HUGE pat on the back, and smile. As long as no one knows you are making it. 1. Soak shrimps in water for 15 minutes. Drain and set aside. 2. Cut garlic, shallots and chillis into smaller pieces. Blend in a blender. Add a little water if needed. 3. Add dried shrimps in small batches. Continue blending. 4. Add sugar and salt. Stir to mix. 5. Heat oil in wok. Fry until mixture is dry and dark brown. 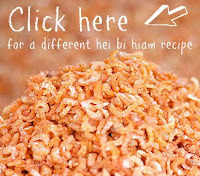 My friend Adeline from The Accidental Mom Blogger made hae bee hiam this week too!! To try her recipe, click on the link below! You and Adeline "par-kat"!!!! Now makes me want to eat rice with that NAO. i would like to know does it taste nice, i wanted to make dried prawn sambal filling for prawn roll- chinese new year goodies. however , one commented that it will not turn out nice and my effort will be wasted. Hi Chloe yes it is really nice. A lot of effort, but really worth it! Good luck with your prawn rolls! Hello my partner forbids me to add sugar in cooking. Would it be ok to omit it and also reduced number of chillies? Was hoping not to make it too spicy so my children can enjoy ha bee!